Located in Nishiki market, this Kamaboko shop has been around for 50 years. Kamaboko, steamed seasoned fish paste or known as “Surimi”, is a popular side dish among Japanese people and there are various ways to enjoy it. 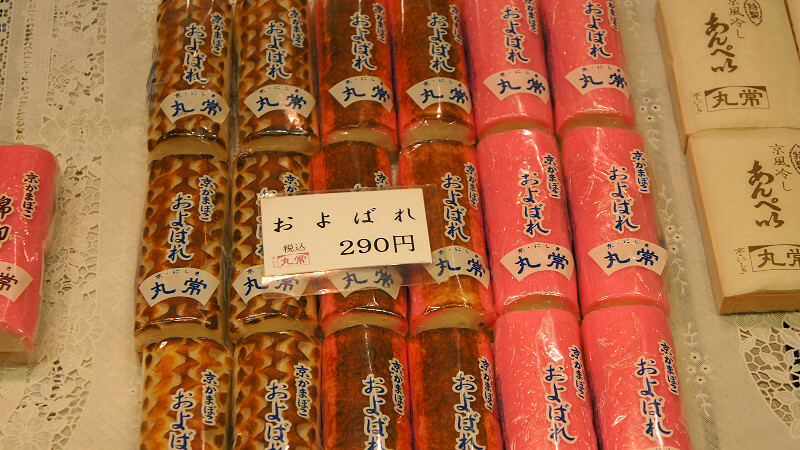 Kamaboko is generally eaten for auspicious occasions such as New Year, wedding, birthday and so on. This shop, Marutsune-Kamaboko, offers a variety of Kamaboko for everyday dishes as well as special ones for auspicious occasions. All of the Kamaboko are made by hand and local people frequently come to buy for their home cooking such as Oden, a Japanese food of stewed vegetables and various sorts of Kamaboko. Kind and friendly staff would welcome you with smile and you would certainly be satisfied by the fine taste of Kamaboko! The most popular menu is deep fried potatoes with butter and it is fluffy like bread but also juicy as it is mixed with steamed seasoned fish paste. It has a light taste overall but you can feel the palatable mashed potatoes and fresh steamed seasoned fish paste. 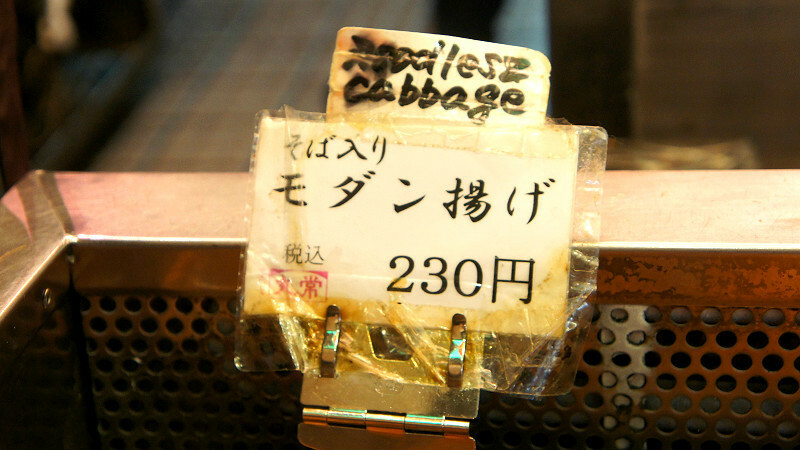 This Kamaboko is popular especially among vegetarian foreign tourists as no meat is used for it. It is unique that this kamaboko is mixed with lily bulb and Japanese honewort called “mitsuba” makes this kamaboko fresher and more flavorful. Kamaboko with lily bulb and mitsuba is wrapped by Yuba, tofu skin made from gently boiled soybean milk. Surface is crispy as it is deep fried but it is juicy and springy inside. This kamaboko is called “modan yaki” and mixed with noodle which is created by the image of Okonomiyaki, a Japanese pan cake, in Hiroshima prefecture. Modan yaki usually indicates the food mixed with noodle, so this kamaboko is also called in the same matter. It is a bit spicy with pepper, and green dried seaweed makes this kamaboko fresher. Although kamaboko is usually chewy a little bit as steamed seasoned fish paste is used, this modan age is fluffy since it is mixed with soft noodles. This kamaboko is a standard kamaboko and is for auspicious occasions such as New Year, wedding, birthday and so on. This kamaboko represents a sunrise and red (pink) color indicates a gratification while white color implies sacred. It is very light and fresh, and also easy to eat. “Oyobare” is suitable for a gift, so please feel free to ask for a simple gift wrap if you would like. Please point at what you would like to try. Staff will confirm what you ordered and give it to you. We recommend that you eat while walking around Nishiki market as you may enjoy the taste of Kamaboko and the lively atmosphere at the same time! If you would like to eat right away, staff would heat up the one you bought. Staff usually ask if you would like them to heat up, but if they don’t, please simply ask to heat up. Please do not touch any items at the shop. 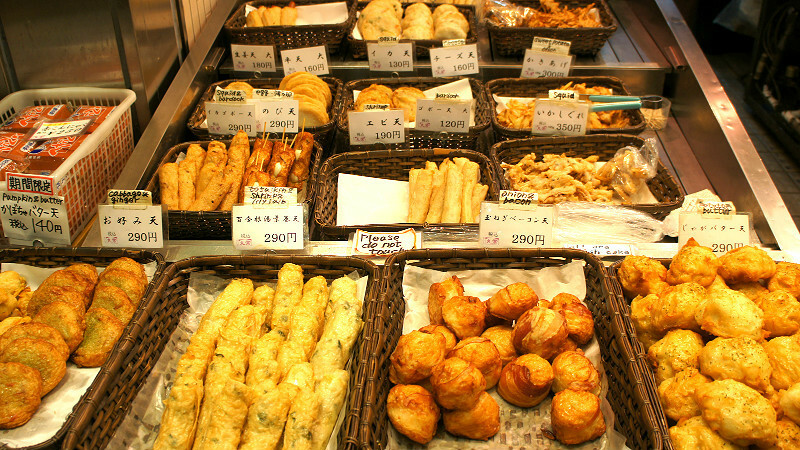 This is a famous specialty shop selling kamaboko, a type of processed seafood product. The kamaboko that are all made by hand and their fried foods with a nice and chewy texture all have a gentle, but delicious taste. They also sell interesting fried foods like butter-potatoes, so they are great as a street food snack too! It would be crowded after 2:00pm. Many of the staff speak English, so please feel free to ask any questions regarding the ingredients inside the kamaboko. English menu is written above the Japanese menu. If you have any questions regarding the ingredients, please feel free to ask to any staff as most of them speak English.